Nuan Nuan (which means warmth), the first Malaysian-born female giant panda cub, will head back to China on Nov. 14, more than two years after her parents unexpectedly gave birth to her on Aug. 18, 2015. Wan Junaidi, Malaysia's minister of natural resources and environment, made the announcement at a farewell ceremony on Thursday at Malaysia's national zoo. 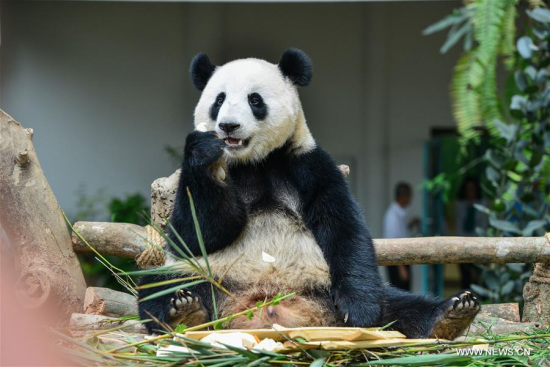 Nuan Nuan, like its name, has brought so much joy to all Malaysians and visitors to the Giant Panda Conservation Center (GPCC) of the national zoo, said Wan Junaidi at the ceremony. Over the past 26 months, Nuan Nuan's growth and development has been good, said Wan Junaidi, adding she is currently active, bonds well with her mother and in good health. Describing sending back the panda cub as "a very difficult decision to make," Wan Junaidi said Malaysia is returning Nuan Nuan to China to give her sufficient time to adapt to her natural habitat, citing an agreement reached between China and Malaysia which stipulated that any giant panda born in Malaysia shall be returned to China once the cub has reached its maturity age of two years old. Mat Naim, director of the GPCC, told Xinhua that Nuan Nuan is currently undergoing crate training where she is put into a special cage for a few hours a day, a necessary step for the panda cub to familiarize itself with the limited space of movement when going on a plane. When talking about the possibility for Nuan Nuan's parents, the two pandas loaned by China to Malaysia in 2014, to have another baby panda, Wan Junaidi said he was told that "because of the environment here is something unique, and the possibility is high and it's not a possibility but it's high probability" to bear another cub.